To register for 2019-2020 Tryouts and to view schedule click http://bridgewaterunited.leagueapps.com/events/1068403-2019-2020-tryouts. Tryouts will be held the week of May 6th. Bridgewater United will be hosting an informational meeting for all interested families prior to 2019-2020 tryouts. The meeting will be held at the Bridgewater Senior Center, 455 Somerville Road, at 7 p.m. on Thursday, April 18, 2019. Questions? Please call the Bridgewater Recreation Department at (908)725-6373. The Bridgewater United Soccer Club would like to thank TOM CANNIZZO for his many years of service as our board president. We truly appreciate the countless hours he has donated to benefit our community. Don't worry, we're not letting him off easy... he is still a member of our board! 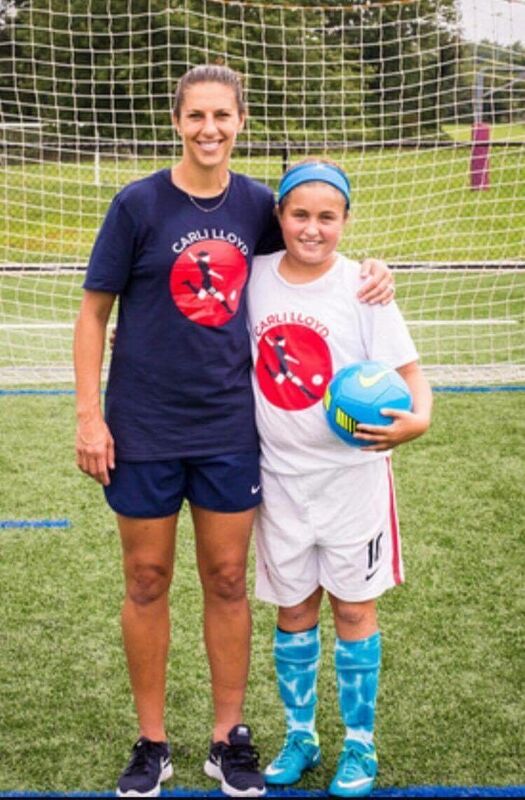 Bridgewater United Soccer Club is excited to share that one of our players, Karly Perez, attended a shooting clinic run by US Women's National Team captain, Carli Lloyd. The 2-hour clinic focused on improving shooting technique and learning different ways to score a goal. After the clinic, each player had the chance to meet Carli Lloyd and have their picture taken with her. Karly loves soccer and currently plays with the BU Pride. She was thrilled at the chance to meet such an amazing soccer player and learn from one of the best! Keep up the good work Karly! CONGRATULATIONS To Molly L. on making the Olympic Development Team!!! Molly has been with BUSC since she was 7 years old and through her hard work and many hours of soccer, she has achieved one of the top honors in USA Soccer 7 years later.